Immortalized in the works of great artists for centuries, this ancient ornamental bears small, oblong green olives that ripen to deep, rich black in early to mid fall. Matures to 8-10 ft. tall if kept in a container, but may get bigger if grown in a suitable climate. Self-pollinating and prefers full sun. Zones 8-10. 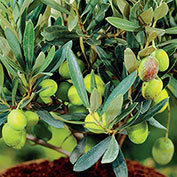 Botanical Name: Oleo europaea 'Manzillo' (the fruiting Olive). Height: 8 - 10 feet if planted in containers; larger if grown in suitable climates directly in the ground. Spacing: 1 plant per pot. If planted in the ground in zones 8 - 10, space 20 feet apart. Depth: Plant on the South or West side of a home or building. The warm wall will accelerate the ripening of the fruit. Spread: 3 - 4 feet in containers, 6 - 8 feet if grown in suitable climates directly in the ground. Foliage: Leathery, long leaves up to 3 inches long. Gray-green above and silvery-gray-green beneath foliage. 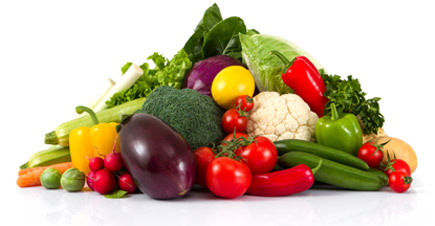 Fruit: Small oblong, plum-like green fruit ripening to black. This is considered a medium-sized olive. Zone: 8 - 10 (hardy to 10 degrees F.). Flower Form: Small blossoms develop in the axils of the alternate leaves. Growth Rate: Moderate growth rate.. 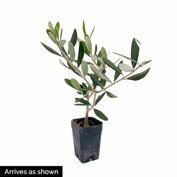 Comments: The olive tree is a valued ornamental evergreen tree. Can become quite large in it's natural habitat (Southwest) with the trunk becoming intriguingly irregular and gnarled. 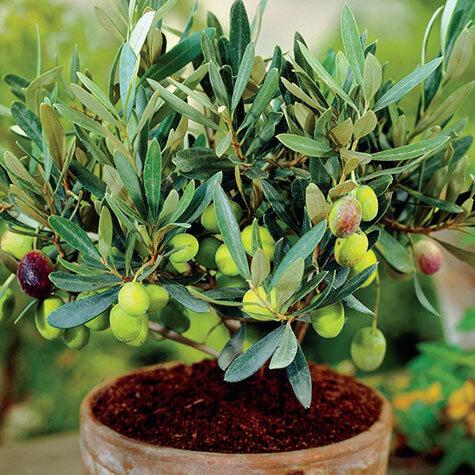 The olive is self-fruitful and will bear small, plum-shaped, green fruit beginning in late Summer and ripening to black in early to mid-Fall.